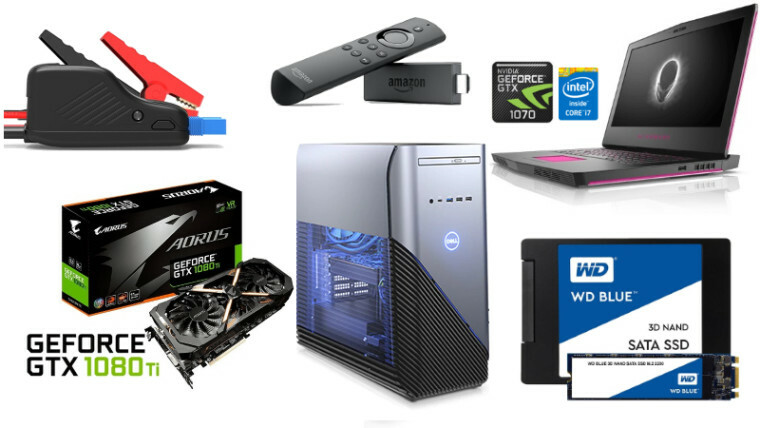 With today's featured TechBargains, we have huge discounts on all sorts of electronics, but first up you can save $130 off a Dell Gaming Desktop, it has the latest Intel Core i5-8400 / 8GB DDR4 RAM with 3GB GTX NVIDIA 1060 GTX and a 1TB HDD all for just $669.99 using the 50OFF699 promo code. Or how about going all out on a Gigabyte Aorus GTX 1080Ti 11GB Video Card with three years of warranty for just $999.99? Or save $25 off the Amazon Fire TV 4K Wireless Media Streamer with Dolby Atmos, HDR, and Voice Remote for only $44.99 at Amazon. 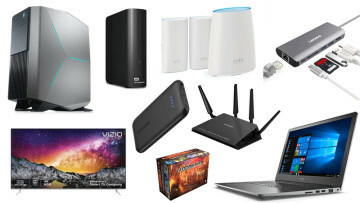 If none of this interests you, you're in luck because there's many more deals below with some great savings. Dell Inspiron 5680 Intel Core i5-8400 6-core Gaming Desktop w/ 3GB GTX 1060 for $669.99 at Dell (use code: 50OFF699 - list price $799.99). Prime Exclusive: Amazon Fire TV HDMI Streaming Stick Media Player w/ Alexa Voice Remote for $24.99 at Amazon (list price $39.99). Prime Exclusive: Amazon Fire TV 4K Wireless Media Streamer w/ Dolby Atmos, HDR, and Voice Remote for $44.99 at Amazon (list price $69.99). Gigabyte Aorus GTX 1080Ti 11GB Video Card + 3-Year Warranty for $999.99 at MassDrop. 500GB WD Blue 3D NAND 2.5" Solid State Drive for $129 at Amazon (list price $139.99). Eufy RoboVac 11+ Self-Charging Robotic Vacuum (Top Rated on Amazon) for $179.99 at Amazon (list price $559.99). Beatit 600A Peak 14000mAh 12V Portable Car Jump Starter for $29.99 at Amazon (use code: T2LVPHYA - list price $49.99). Star Wars Hero Droid BB-8 Fully Interactive Droid for $117.52 at Amazon (list price $229.99). HOPDAY U8 Noise Cancelling IP68 Waterproof Bluetooth Earbuds for $9.99 at Amazon (use code: LBF2JXEA - list price $22.99). 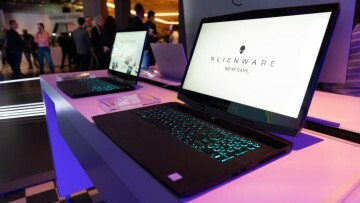 Alienware 15 R3 Intel Core i7-7820HK 4.4Ghz Overclocked Quad-Core 15.6" 1080p Gaming Laptop w/ GTX 1070, 512GB SSD, 16GB RAM (Refurb) for $1599.99 at PCMag Shop (list price $1882.99). Dell XPS 13 8th-gen Intel Core i7-8550U Quad-Core 13.3" 1080p Ultra-thin Laptop (8GB RAM, 256GB SSD) for $935.84 at Dell (use code: 50OFF699 - list price $1299.99). Lenovo ThinkCentre M93P MiniTower Intel Core i5-4570 Quad-Core 4 Win 10 Pro Desktop (Off-Lease Refurbished + 18-Month Warranty) for $249 at PCMag Shop (list price $299.99). 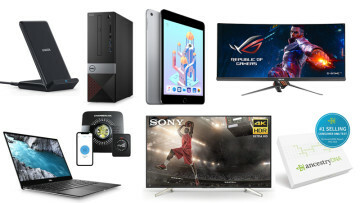 Dell Inspiron 15 5000 Gaming AMD FX-9830P Quad 15.6" 1080p Laptop w/ 16GB RAM, 4GB AMD RX 560, 256GB SSD + 1TB HDD for $699.99 at Dell (use code: 50OFF699 - list price $999.99). Dell S2718NX 27" 1080p HDR IPS Monitor w/ AMD FreeSync + $100 Dell Gift Card for $259.99 at Dell (list price $349.99). Dell S2418HX 24" HDR 1080p InfinityEdge IPS Monitor w/ AMD FreeSync + $50 Dell Gift Card for $199.99 at Dell (list price $289.99). 60" Sony 60X690E Bravia Smart 4K HDTV + $250 Dell Gift Card for $898 at Dell (list price $998). 65" LG 65SJ8500 4K Super UHD HDTV + 49" 49UJ6300 UHD 4K HDTV + $300 Dell Gift Card for $1599 at Dell (list price $3498). 70" Vizio Smartcast E70-E3 4K Ultra HD Smart HDTV for $879.99 at Dell (list price $1199.99). 75" Samsung UN75MU6300 4K UHD Smart TV + $350 Dell Gift Card for $1599.99 at Dell (list price $2799.99). Luma Home 802.11ac Dual-Band WiFi Mesh Router (3-Pack) for $139.99 at PCMag Shop (list price $199.99). Netgear Arlo Pro HD Wireless 2-Camera Security System + Netgear Orbi Whole Home WiFi System for $595.43 at Amazon (list price $719.99). DJI Spark Portable Mini Drone Fly More Combo (Green) for $466 at Amazon (list price $599). SunFounder 37 Modules Sensor Kit V2.0 for Raspberry Pi for $59.39 at Amazon (use code: DH9X93GL - list price $98.99). Amazon Echo Dot Bluetooth Speaker w/ Alexa for $39.99 at Amazon (list price $49.99). Amazon Echo Bluetooth Wireless Smart Speaker (2nd Gen) for $84.99 at Amazon (list price $99.99). Andoer WiFi 4K Ultra HD Touchscreen Action Camera w/ Sony Sensor for $46.99 at Amazon (use code: ANDOER3A - list price $93.98). Anker Wireless Charger Charging Pad for $11.99 at Amazon (use code: BEST9811 - list price $17.99). Amysen Wireless Charger Charging Pad for $11.49 at Amazon (use code: UW98V5CQ - list price $22.99). In and out of stock - LEGO Star Wars Ultimate Millennium Falcon 7541pc Set (Extremely Limited) for $799.99 at Amazon. 23andme DNA Ancestry Test Kit for $79 at Amazon (list price $99). Ecovacs Deebot N79S WiFi Smart Robotic Vacuum Cleaner w/ Upgraded Max Suction and Alexa compatibility for $199.98 at Amazon (Clip $50 Coupon - list price $249.98). AirThings Corentium Home Radon Detector for $149.95 at Amazon (list price $199.95). Black and Decker BDH2000L 20V Battery Cordless Hand Vacuum for $59.99 at Amazon (list price $72.67). Oittm 950W Portable Ceramic Electric Oscillating Heater for $26.99 at Amazon (use code: CQED6QEB - list price $46.99). Tacklife 60W 11-in-1 Soldering Iron Kit for $16.48 at Amazon (use code: 8I5N5JQ6 - list price $21.97). These are just a few of the deals on offer, and they are only good for a day or two (depending on the manufacturer). 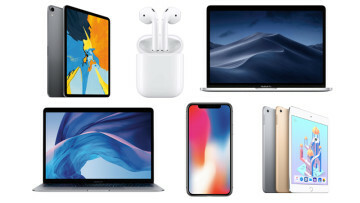 For more great deals go to TechBargains.